If you happen to find yourself in Chiang Mai for a time, you might as well take the leap and head over to Chiang Rai. The city is within an easy day trip and is well worth the effort. The city is filled with unique destinations like The White Temple and The Golden Triangle and is not to be missed. 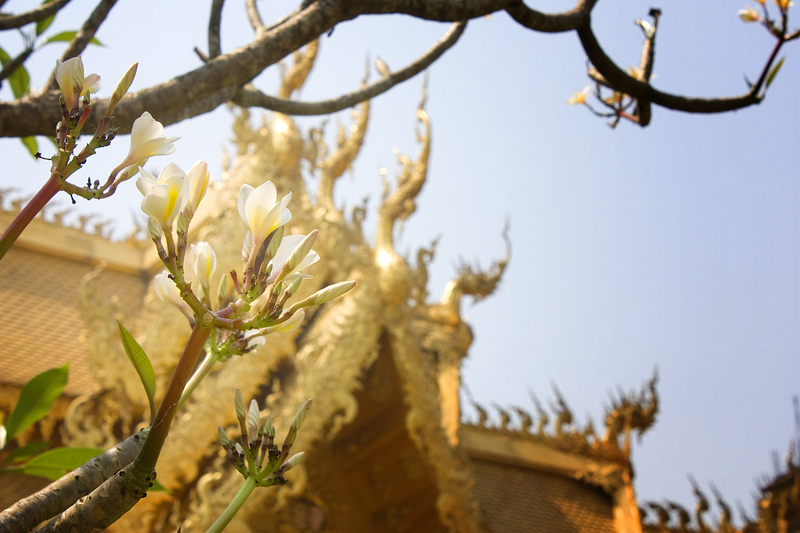 Chiang Rai is literally translated to “Old City” and is considered the older, big brother of the shiny, new Chiang Mai. Chiang Rai definitely has a more ancient feel and is more spread out than Chiang Mai. I booked a day trip through my hostel and was loaded into a van with about eight others at about 7:30am. We were greeted by our nice tour guide who informed us that we would be doing a lot of driving that day. That is one thing to keep in mind for a Chiang Rai day trip, it’s a lot of time in the car and short spats at the locations. No matter, I love a good road trip and I settled into my seat and turned up my ipod. The drive in itself was quite impressive. About every five minutes or so either a massive statue or a intricate temple would whiz past the window and I always find watching three or four people crammed onto a scooter interesting. Our first drive was about two hours up to the hot spring just outside of CR. The hot springs were quite small but made an impact as the steam billowed up into the air upon arrival. Old women roamed the site with baskets of eggs for purchase to cook in the boiling water. There was also a slightly cooler pool that you could rest your weary feet in if you so chose. This was definitely the least interesting part of the day and thankfully it got better from there. We all piled back into the van and headed to one of the most beautiful temples on earth. 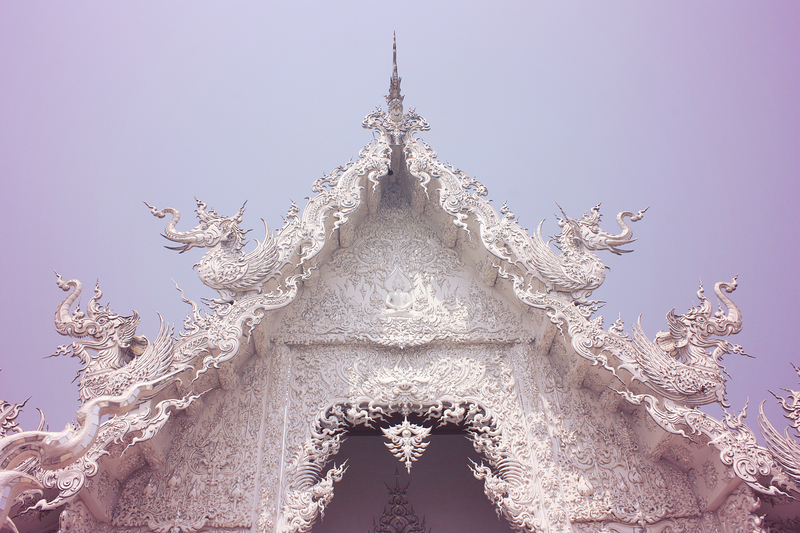 The White Temple was absolutely one of my top destinations for Thailand and one that did not disappoint in the slightest. Although it appears ancient, the temple itself is actually only about 20 years old. It is in the midst of a 60 year construction plan and will be growing continually for the next 40 years. The temple is being designed and financed by one of the wealthiest men in Thailand and he is creating it as a symbol for his beloved country. A cardboard cut out of this smiling man greets you as you enter the complex. 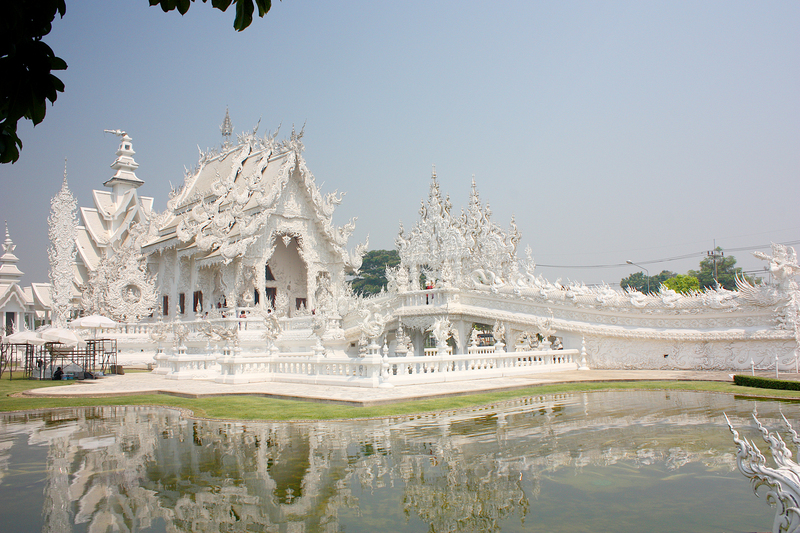 True to it’s name, The White Temple is pure white and offers both traditional and modern Thai design. The bridge to the main temple rises above a sea of outstretched arms which I’m sure have a deep, symbolic meaning but of that I am unaware. The grounds are flanked with many statues and masks hang from most of the trees. 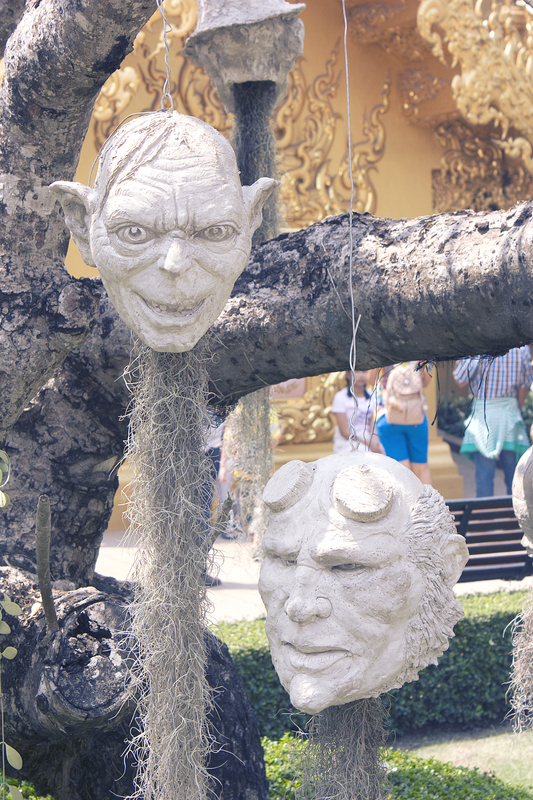 After seeing one that looked eerily like Gollum from Lord of the Rings, I noticed that one tree in particular had masks inspired by famous characters including Gollum, Hellboy, Batman and more. Whilst wandering the grounds I was stopped by a group of Thai teens who were working on a project for their English class. Being the perfect person that I am (not to mention an English teacher) I of course let them interview me and ask lots of random questions about my experience in Thailand. This was not the last time that it happened to me on this trip. I guess they can just tell that I’m a teacher. I can not stress enough how incredible this place was and the photos only give it the smallest amount of justice. The White Temple is worth any and every trouble you might encounter to get there. You will be in awe. 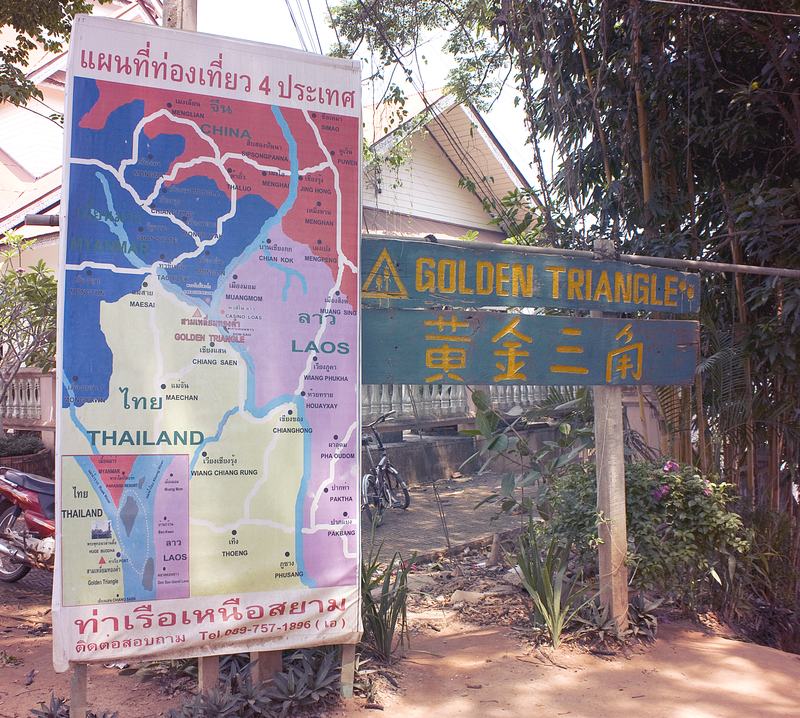 After leaving the temple we headed out towards The Golden Triangle. 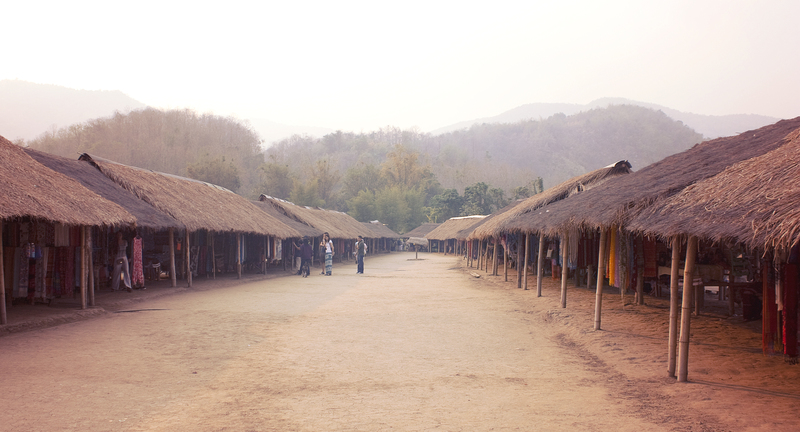 This area is a huge draw to those in northern Thailand because it is the area where Thailand, Laos, and Myanmar meet. The area is notorious for being where the illegal opium (or “black gold”) trade took place in years past. The small stretch of land between the counties is not under any particular country’s rule therefor has no laws. This made it the perfect place for drug trading. The trade has since been dispatched but the stories live on. 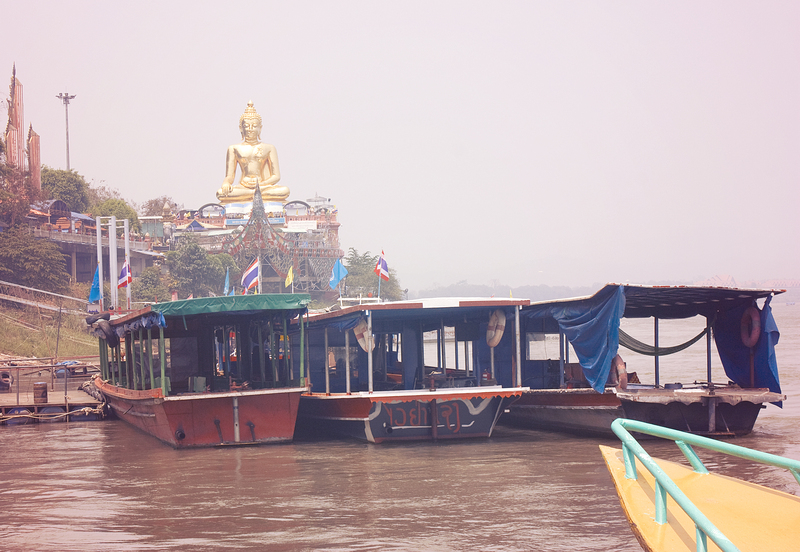 My tour had us climb aboard a boat and float down the Mekong River, taking in the sites of Myanmar and Laos. We learned the history of the area and saw the stretch of land where the trading took place. 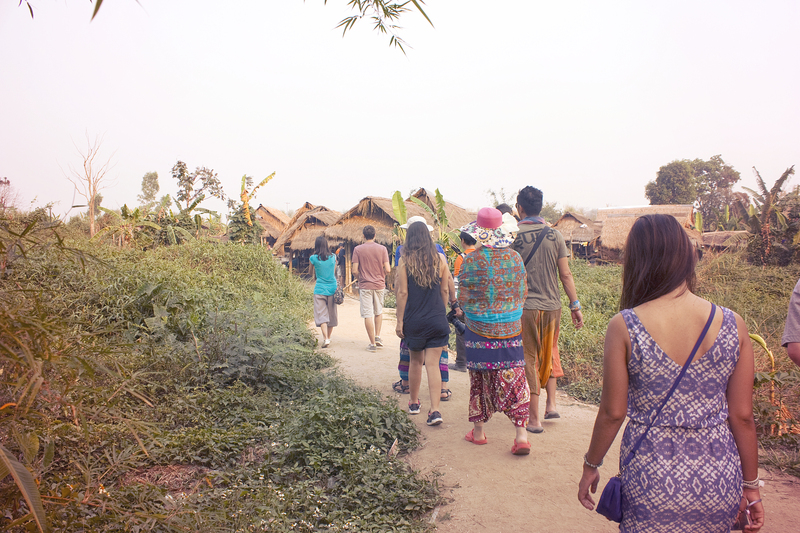 Laos has an understanding with Thailand and allows touring companies to land on it’s boarders for a brief walk about the country. Laos, understandably seemed very similar to that of Thailand just across the river and we mostly saw an outdoor market. The area is known for their snake and scorpion whiskey which was not recommended to be consumed by women. Who knows why, but I decided to pass on the whiskey and simply buy a gift for my Mum. She would have been so proud. 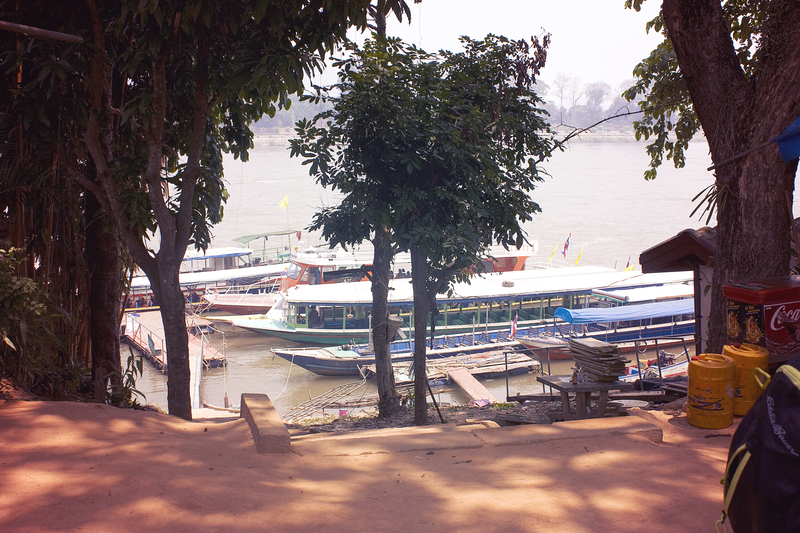 We crossed the river back to Thailand and went to lunch at a Thai buffet. This was the only place that I had the opportunity to try truly spicy Thai cuisine. Yes, it was spicy and delicious, but still not to much for me to handle. I swear I have broken taste buds. As a solo traveller this is where group tours are either great or a bit annoying. I had a very interesting talk over lunch with a French couple living in Singapore. We compared expat stories and recommended travel destinations. It’s so fun to cross paths with other humans for such a short time but at the same time share such a profound experience together. Our final stop for the day was probably the number one reason I ever dreamed of visiting Thailand in the first place. When I was probably around six years old I remember rummaging through my brother’s old National Geographic magazines. I found one that featured a beautiful lady on the front with many long rings around her neck. This intrigued me and I flipped to the article. 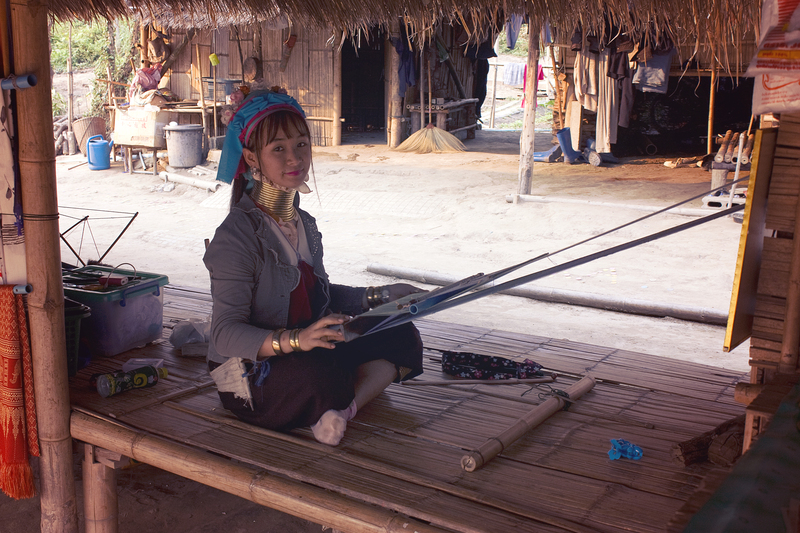 I learned about the Long Neck Karen Tribe and how these women wear rings in order to elongate their necks. Those images have stuck with me all these years but I never would have dreamed I would ever get to see them in person one day. But yes, part of the tour was a stop at one of the Long Neck Karen tribe villages to get insight into this unique people. The village itself wasn’t entirely authentic, obviously. It did feature real Karen women wearing the rings, but with more modern times come less traditions. While we walked through the village we could stop and take photos and chat some broken English with some of the ladies. There were also many scarves available for purchase (for which I indulged). It was an overall surreal experience for me due to the story above but I wouldn’t necessarily consider it a must do if you have no prior knowledge of the tribe. I read a review that considered some of the “tribe experiences” to be comparable to a human zoo atmosphere and although I wouldn’t go that far by any means, I would have preferred a more authentic experience if available. But if you are short on time, money, and equipment, a 10 day trek into the jungle might not be an option. I still feel very fulfilled having gotten to see the Karen tribe first hand and I will hold onto this memory all my life. After the tribe we climbed back into the van for the long 3 hour drive back to Chiang Mai. Although the day was long it was very full and not one I will soon forget. 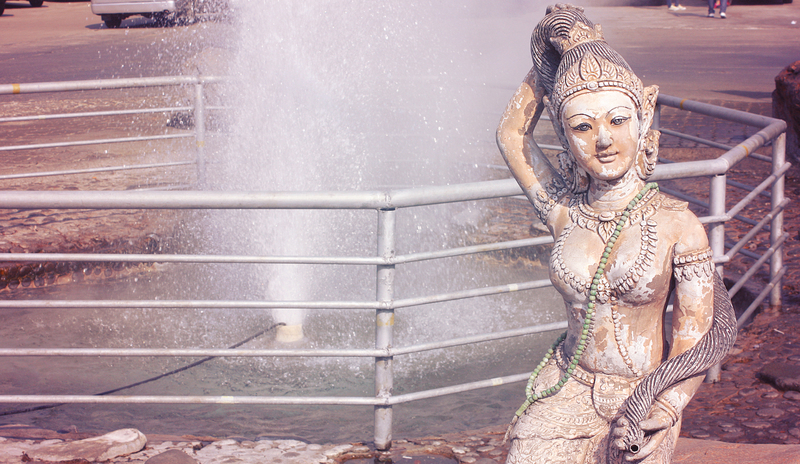 Chiang Rai has its own distinct feel and is filled with gems worth seeing. Be sure to follow and subscribe to my Youtube channel for more on Thailand and other travels! Beat the Hong Kong Heat!